If you plan on running a podcast or just talking to Aunt Sally on Skype, you’re going to need a microphone so the other end can hear you. In fact, USB microphones have become standard pieces of equipment for just about anyone that has to speak via an internet connection. With so many options on the market, how do you know what to choose? The quality of the recording is a huge factor when you’re picking out which mic you’re going to want to use for your podcast. Some sound better than others depending on the purpose they’re being used for. If you’re going to be talking into the microphone for a basic podcast, then you’re going to look for a different than someone who plans on using it to record music. Cost is another consideration that you’re going to want to think about. There are some USB mics that are fantastic with a relatively low-cost price point, while there are others that really aren’t worth the price on the tag. What about value? One of the reasons that people will choose to go with a USB mic is because they’re designed to be easy to use and to install. They’re all supposed to avoid extra costs that are normally incurred with a microphone like audio interfaces. If they’re too complicated to use, then they may not be as valuable to you and worth your time. Then, of course, you’ve got to consider the mic’s features. Do you want your microphone to have built-in gain controls that are easily adjustable? What about a mute button? Do you want your mic to have a headphone jack? You’ll also want to get to know some of the vocabulary associated with microphones so you’ll be knowledgeable about what you’re looking for. In fact, here are a few key words that you should keep in mind when you’re searching. When you compare these different attributes to various USB microphones on the market, you’ll be on the right track picking out the best USB mic your money can buy. Don’t expect professional recording-style mic quality just yet, but these are some of the best USB microphones around. The Blue Yeti is hugely popular and rightly so. The precise sound that comes from this USB mic easily makes it the best out on the market today. You’ll find several pick up patterns to choose from that include cardioid, omnidirectional, bidirectional, and even stereo patterns. In the front, you’ll find several different controls that include headphone access, a mute button, as well as gain control. This is a major find because many USB mics don’t have these optional controls, so take advantage of them. Sound quality is also repeatedly deemed excellent from Blue products, and the Yeti is no exception. You might not even be able to tell that it’s a USB mic from listening to your recording. The sound quality you’ll get with the Blue Snowball ICE is excellent, but it’s not quite as good as the Rode NT USB. If your goal is to produce a quality YouTube channel, then this would make a great pick for you. The stand is removable, plus the mic doesn’t weigh much, making the mic easy to move as needed. The downside of this mic is that you won’t find any kind of direct monitoring. You also won’t find gain controls. Of course, the price for this model from Blue is still great for the quality that you do get if you decide to go this route. This particular mic offers mixing controls, pressure gradient, a cardioid pick up pattern, and it can be used straight out of the box. You can also use it in a few different ways – on your desk or ring mounted. The provided storage pouch adds a nice touch to this top-quality mic. Looks can be deceiving for this mic but in a positive way. 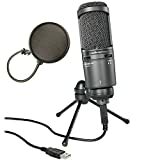 It looks just like your traditional XLR condenser microphone, but it is actually a USB mic. 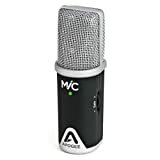 This mic is a great choice if you are a singer or other kind of recording artist because it has excellent pickup patterns with wonderful audio clarity. There are also more uses for this than leaving it on your desktop. You can mount it to a stand or a shock mount if needed. When it comes to cost, the AT2020 USB is more expensive than the Yeti, but if you’re concerned with audio quality, this is definitely better. The Samson Meteor is a popular USB mic because it works almost as well as the Blue Yeti. It is similar in size and capabilities. This USB microphone is also easier on your wallet. It is markedly less than the Yeti and still produces a fantastic sound. If you record from your Apple smart device, you can also directly attach the Meteor with the right converter. If you prefer working with Apple gear, the Apogee Mic 96k works well with these devices. If you’d like, you can also connect via USB adapter to any other system. This one works pretty much right out of the box as it features plug-n-play compatibility, plus it doesn’t take up much room either. The design is flexible enough that you can use it with a traditional mic stand or just connected to your system or device. 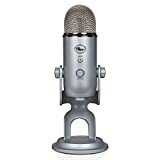 Not to be confused with the Blue Yeti, this one is more expensive and even more versatile than its little brother. There are multiple pick up patterns for you to choose from, but where the Pro really shines is how it records. The Pro records at a higher sample rate with greater bit depth. The recording capabilities mean that the Yeti Pro captures more sound details that may be missed in other USB microphones. When budget is your primary concern, don’t feel like you need to sacrifice sound quality for price. Instead, go for the CAD U37 to get quality sound for a fraction of the cost. The cardioid pickup pattern works well to isolate your sound in addition to a few other options like a bass-reduction switch. You can also use this mic to record varied sounds from strings to voices. You’ll just need to play with the settings to find the sound you want. The Shure PG42 is hands-down the best in high-quality USB microphones. Some might even say that this particular model competes head to head with traditional models. On this mic, you’ll find gain control, monitoring mix control, and a directly connected headphone jack option. The recording quality if outstanding and you’re sure to love the way you sound. If you’re an artist looking for the best USB microphone on the market, this one is the one that you should choose. What if you record on-the-go? Chances are that you’ll want a smaller, more portable mic than most of these others that are desktop models. The Samson Go Mic is the perfect solution to that. It folds into a smaller size, making it perfect to stick in a pocket or purse. As a bonus, it’s extremely budget-friendly and comes with several extra accessories like a cable clip, zippered carrying pouch, and even a stand adapter. Think about where you’re going to be recording because that makes a difference. If you’re going to be doing a lot of traveling, then you’ll want one that is portable. If not, then you can get something a that is more likely to produce a professional sound. Also, consider what you can afford. Just because you want the cream of the crop doesn’t mean it’s worth breaking the bank if it’s more than you can spend. You may or may not also want to think about what the mic looks like. The ones that look like professional mics tend to give off a different vibe than say the Snowball. Learn the differences between condenser mics and dynamic mics. Condenser microphones are sensitive to sound while dynamic mics are the preferred mic of stage performers due to the way the cancel out sound. Higher bit depth and sample rates equal higher recording qualities. The sample rate is essentially the amount of pieces of sound that are recorded, so if a sound were only recorded maybe eight times in a single second, then the sample rate would be 8Hz. As you go higher, the sounds are recorded more frequently, which makes for better audio quality. The other part of audio quality goes to bit depth. Bits are like crumbs that make up a single cookie. The more crumbs you have, the bigger a cookie you have. If a mic has a 24-bit depth compared to a 16-bit depth, the more detail you’ll have in a sampling goes to the sampling with the higher bit depth. You’ve been researching to find the best USB microphone for your money, right? Hopefully, now you’ve got even more information that you can add to your arsenal to help you decide what you want. Don’t go in blind and put down money if you aren’t sure about what you’re getting. You can even reach out to other users via social platforms like YouTube or on podcasts to get real feedback from real people. Try to understand the negative and the positive reviews that you’ll see. Remember, too, that a lot of times, negative reviews tend to happen because people don’t know the capabilities of the mic they purchased. That goes back to getting to know the vocabulary to you know what you’re looking at. Do your homework, research reviews on places like Amazon, and you’ll be ready to make your choice.